The Barelas-South Fourth Street Historic District near downtown Albuquerque is a linear corridor running along South Fourth Street-Historic Route 66-through the heart of one of the city's oldest areas, the Barelas residential neighborhood. Buildings in the district reflect the different phases of development along South Fourth Street and convey three interrelated stories. The Hispanic farming village of the early 19th and 20th centuries was modernized when the Atchinson, Topeka, and Santa Fe (AT&SF) Railroad built tracks through the Middle Rio Grande Valley. The railroad arrived in Albuquerque in 1880, and the Atchinson, Topeka, and Santa Fe located its repair shops and a roundhouse in the Barelas neighborhood stimulating the local economy and urban development. In 1926, Fourth Street, the main north-south corridor through the area, became U.S.Route 66, giving rise to automobile-oriented development. After the designation of Route 66 along South Fourth Street, commercial development began in earnest. Over the next 30 years, the district flourished. The Barelas-South Fourth Historic District reached its commercial peak in the mid-1950s as a thriving automobile commercial strip serving the local community as well as travelers. The commercial strip offered local residents and farmers from Albuquerque’s South Valley a full line of businesses with bilingual proprietors. It also provided Route 66 motorists a range of gas stations, grocery stores, and curio shops. At the height of activity, 4,000 to 6,000 cars traveled the road each day. The mixture of residences and a variety of commercial building types in the district create a varied streetscape pattern. For the most part, the commercial strip buildings and supermarkets at the edge of the sidewalk define a traditional commercial, walled corridor. Owner-built, utilitarian structures and vernacular interpretations of popular architectural styles account for the majority of buildings, although a handful of high style buildings form the visual landmarks of the district. Most of the commercial strip stores have little or no overt architectural detail, but achieve their effect through a straightforward presentation of standard elements--door, windows, and sign panel--enlivened, perhaps, by a textured walls surface material. Kandy’s Supermarket and Piggly-Wiggly Market are examples of this type of design. After the designation of Route 66 in 1926, some builders drew from the Mission-Mediterranean genre in an attempt to attract the eye of the auto tourist. Curvilinear or stepping parapets and terra cotta tiles, such as those on the Magnolia Service Station, are the most common types of details. One service station combines a tile roof with Bungalow style brackets to strike a domestic note appropriate to the neighborhood. A number of prominent Streamlined Moderne buildings provide the strongest visual note. Driving along South Fourth Street, motorists see rounded corners and windows, white stuccoed or tile walls, glazed tile kick plates, projecting flow lines, pipe railings, porthole windows, and a faceted tower. Note the 1200-1300 block, Durand Motor Company and Service Station, and Arrow Supermarket. After World War II, Albuquerque builders turned increasingly to the more angular International style, made more at home in the American West by the use of textured brick piers and modest Territorial Revival brick cornices. See Mike’s Food Store and the Tasty Freeze Drive-in, a drive-in restaurant erected about 1960 with articulated I-beam columns and beams and single pitch roofs that echo that era’s structural expressionism, sometimes referred to as Exaggerated or Mannered Modernism. Some pre-World War II buildings were remodeled with veneers of variegated-colored cast stone. Stone or cast stone veneers, polychromy and rich textures are all components of an aesthetic, streetscape style popular in Mexican-American neighborhoods across the Southwest following World War II. 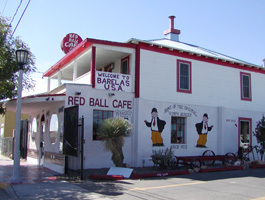 See the El Coronado Café and Red Ball Café. The Barelas-South Fourth Street Historic District suffered an economic decline after the AT&SF converted from steam to diesel locomotors. Repair shops closed causing dramatic unemployment and the movement of residents out of the district. Completion of the interstate in Albuquerque also added to the neighborhood’s decline. The decline in the 1970's led to the demolition of boarding houses and homes on South Fourth Street and the displacement of families. In 1974, construction of the Civic Plaza closed Fourth Street to through traffic downtown, which hastened the social decline in the community. The diversion of traffic to the interstate devastated the commercial district, which was entirely dependent on tourism and shopping. Owners boarded up storefronts and crime increased. 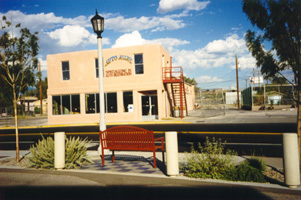 Revitalization efforts began in the mid-1990s when the New Mexico Legislature appropriated $12 million to construct a Hispanic cultural center at the southern end of the Barelas-South Fourth Street Historic District. In 1999, dignitaries from Spain, Mexico, and the United States attended groundbreaking ceremonies for the National Hispanic Cultural Center. This major public investment was an impetus for additional revitalization projects in the Barelas neighborhood, including façade improvements and business renovations. Now rejuvenated, the corridor today is home to popular shops and restaurants like the Red Ball Café and Barelas Coffee House. The district was listed in the National Register of Historic Places in 1997. The Barelas-South Fourth Street Historic District is located along 4th St. from Stover Ave. to Bridge St. south of downtown Albuquerque, NM. A number of shops, restaurants, and other businesses in the dictrict are open to the public.